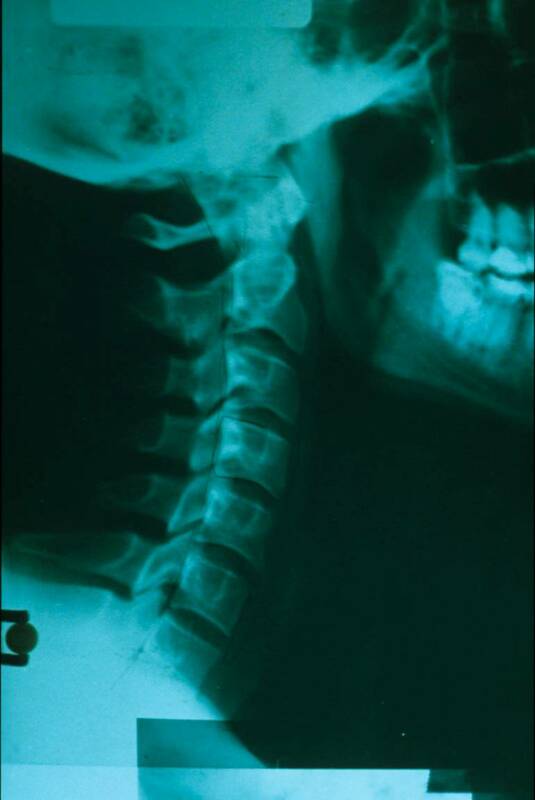 Spinal disc degeneration is a major cause of neck and back pain. Spinal disc degeneration has several names. It is also called degenerative subluxation complex, degenerative disc disease, discogenic spondylosis, spinal arthritis and triple joint syndrome. There are several phases to spinal disc degeneration. On this page we will outline the phases of spinal disc degeneration. A normal x-ray shows a foreword C shaped curve. There is good space seen between the vertebrae. This is where the intervertebral disc is located. The vertebrae are square on the edges. This normal foreword C shaped curve provides for a spring or a shock absorber for the weight of your head. 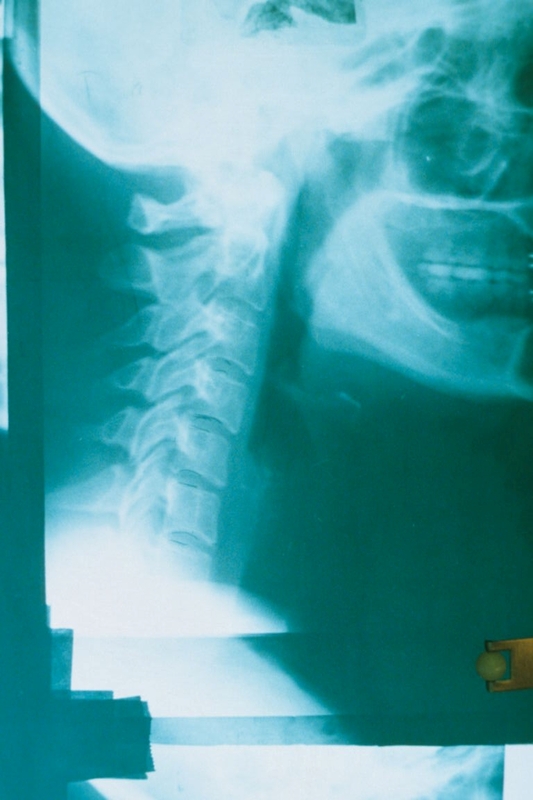 The next x-ray below shows what happens after an accident or injury to your neck. When the head goes farther than it should in any direction,as in a whiplash injury, there is ligament damage and the forward curve will flatten. In this stage there is no disc degeneration yet but you have now lost the spring or shock absorber in your neck and abnormal forces are being applied to it. If neck pain has not started by now it's on the way. In the next phase the disc will start to degenerate. Abnormal forces on the neck will cause the disc to degenerate slowly over time. The disc does not have an artery that goes to it. The only way the disc gets its blood supply is through movement. After an injury that section of your spinal column will tighten up. Doctors call this a fixation. When two vertebrae become fixated the disc will lose blood supply and slowly degenerate. Your body knows this is a weakened area and will begin to deposit calcium into the ligaments that surround the joint to try to strengthen this area. The vertebrae will get spurs on the end of the body of the vertebrae. These are three different x-rays from three different people. After the initial accident the neck curve changes are often immediate. It can take five years for disc degeneration to occur. This is a very slow process. Pain does not always happen immediately after a neck curve change. It can also take years for pain to develop. 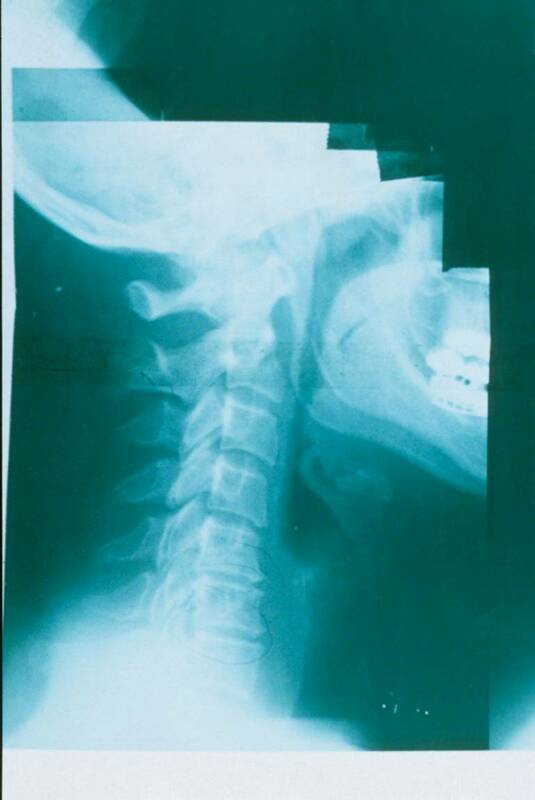 This is why it's important to have your neck examined by a doctor after an accident. So it you have had an accident, whether you are having pain or not, schedule an appointment to have your back checked. See our New Patient Offer on our home page.